I just made this festive dip for a fall party I hosted last week – – it was a hit, so of course I had to share it with you! If your hosting a party this holiday season, maybe even today, you should consider adding this flavorful dip to your spread. I love the smooth texture, the butternut orange color and the surprise of flavors experienced in this easily made appetizer. 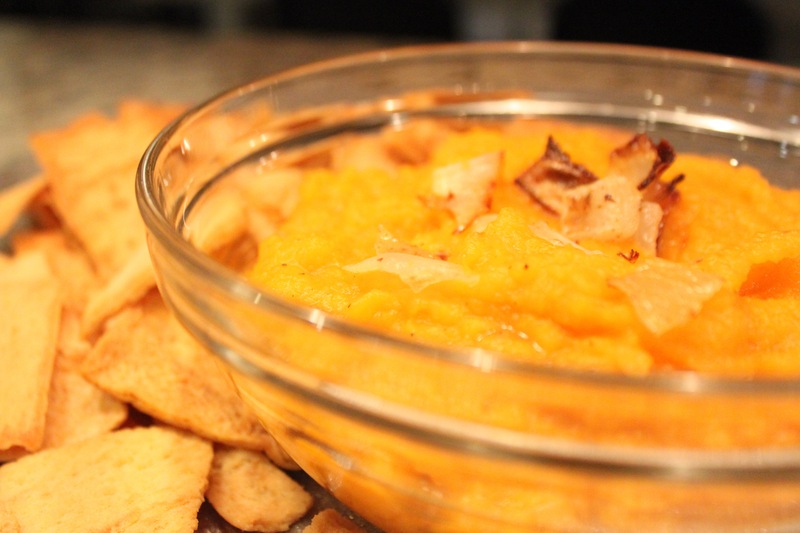 If you already have your appetizers thought out then turn this puree dip into a first course. Add some chicken stock, cream and other herbs to create a rich and hearty soup. I know it’s going to be another crowd pleaser! I saw this dip made in the October edition of Rachel Rays ‘Ever Day’ magazine, which I LOVE. I would recommend you subscribe to the magazine … along with my blog … if you are looking for easy recipes and creative cooking ideas. Prep: Cube butternut squash in one inch squares and dice onions in squares of desired size. Toss in a large bowl with extra virgin olive oil, salt and pepper, coat well. Place on a lined baking sheet and bake at 400 degrees F for 25-30 minutes, or until golden brown and fragrant. Blend roasted squash and onions until you have desired consistency. Add a little more oil if needed to smooth out consistency. Serve immediately with pita chips. notes: If you’d like this dip to be sweet rather than savory you can add some maple syrup and a dash of cinnamon. You can also serve the dip with cinnamon sugared pita chips. buy now: Mixing Bowls from Williams Sonoma, smaller mixing bowl used a serving dish and pictured above. … hope you all have a safe and fun October 31, whatever you may be doing. Also, happy birthday to MG, a friend of mine and cook extraordinaire, living in Phoenix, AZ. I made this for a baby shower and it was a huge hit! And it’s healthy too! Thank you for the great idea!